MJ fell asleep while she was playing this morning. 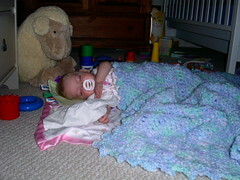 We covered her up with the blanket her Aunt Amy made. Looking on is the Big Lamb that Uncle Dave no doubt had a hand in picking out. Dressed up and ready to crawl.